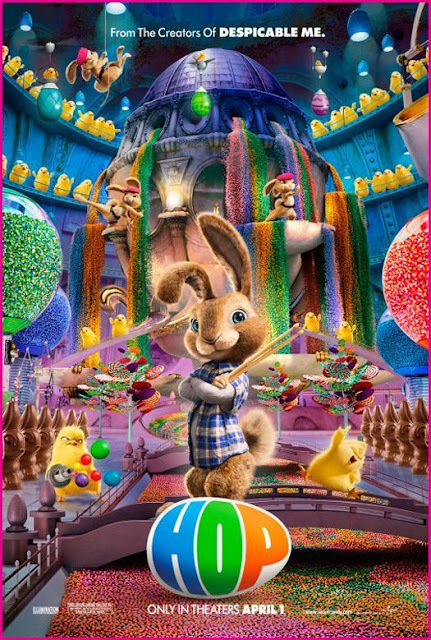 We almost missed the creation of an Easter bunny themed movie in 2011. 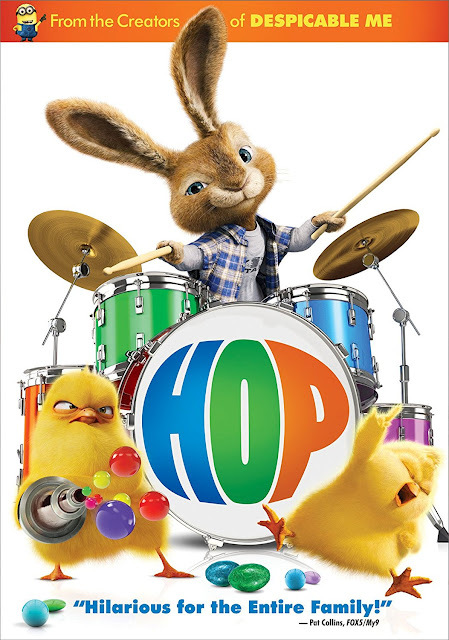 Hop premiered on April 1 and turned out to be a very colorful, musical, state-of-the-art animation movie featuring live action (human) actors. It was released on blu-ray disc and DVD on March 23, 2012. RATED: Hop is rated PG. We all know that the Easter Bunny has an easy job. He works one day a year, travels the world in a single day and is loved by everyone. Sound great? Well, it does NOT sound great to EB, the bunny whose job it is to be the Easter Bunny this year. He finally reconciles himself to the fact that all artists have to suffer to become great and that he will have to be the Easter Bunny. However, he is struck by a car and the driver is forced to take him in and eventually to help save Easter. In the process, both the bunny and the man are forced to grow up. Russell Brand voiced Hop. You'll recognize him from other projects that include Despicable Me and Get Him to the Greek. You can find his full filmography on IMDB. 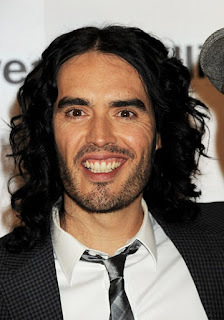 On the blog She Knows, author Kim Grundy says that Russell Brand turns on the charm and his English accent to play the son of the Easter Bunny in HOP. In her interview with the actor they discuss, amongst other things, childhood Easter traditions, rabbit "whoopsie" and why he believes in the Easter bunny. Hop is rated PG for comic peril and violence. The Movie Mom recommended it for children in kindergarten to third grade. Unfortunately, her review of Hop is no longer available but NYC Single Mom also wrote an excellent review in which she included a list of what she liked and what she did not like about this movie. She summarised by saying that it was wonderfully funny, that she would recommend it and that the trailer does not do it justice. I did not see a lot of movie merchandise available for this movie though there was some. I love this plush version of E.B., which is still available though in a limited way. You will find the mini plush figure shown here on Amazon by clicking right here and the full-size figure by clicking here. It turns out, however, that there is a lot more E.B. 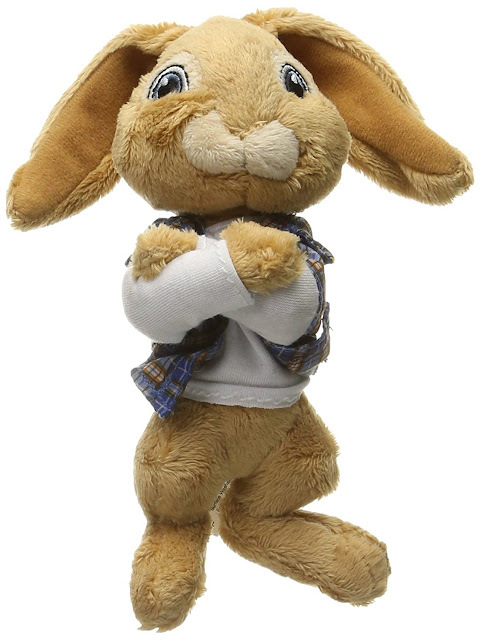 Bunny Hop movie merchandise available on eBay. You can see for yourself by following this link. 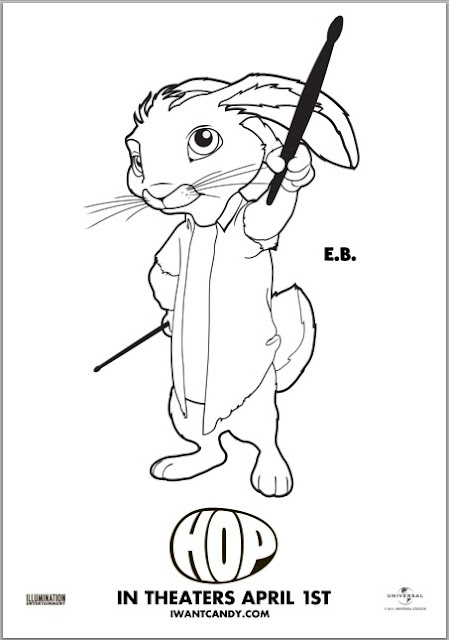 This HOP free coloring page was originally available through the official website I Love Candy, which does not exist anymore and forwards you instead to a Universal page about the movie as seen here. While there are a few interesting short clips there, there no longer are free coloring or activity pages. Did you enjoy the movie Hop? Do you know where jelly beans came from? If you do not, we know that you did not watch the trailer or the movie, LOL. This movie definitely had some potty humour. If you would like to add Hop to your collection or even just watch it on Amazon Video, you can find it by clicking right here. Order your copy of HOP on Amazon. My family friendly Easter dinner menu. Author's Note: This page originally written elsewhere.